This remarkable Revival home was built in 1863, entirely in the style of the European classicism. Yet, some foreign explorers have a good reasons to compare the building to an Italian Palazzo from the Renaissance. Its owner was the famous merchant and Revival social figure, Nikola Nedkovich. The forefront of the house is richly decorated with a solemn four-column portico with round arches. The most remarkable places in the inner part of the house are the symmetrically located rooms with ceilings ornamented in geometrical style and richly painted walls. The rooms are richly decorated and they have a strict specific purpose. "The Green Room" is the woman`s, "The Red Room" is the drawing room, "The Purple Room" is the dining room and "The Orange Room" is the sitting room. The rooms situated to the yard are drawn with landscapes and views of different European cities. 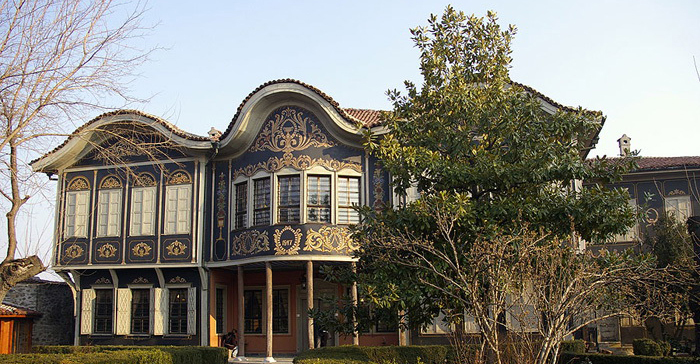 Today, Nedkovich`s House is furnished in an exposition "Antique Urban Type", which represents the interior arrangement of the rich Plovdiv homes from XIX-th century. Furniture and personal belongings of Nedkovich family are exposed there. 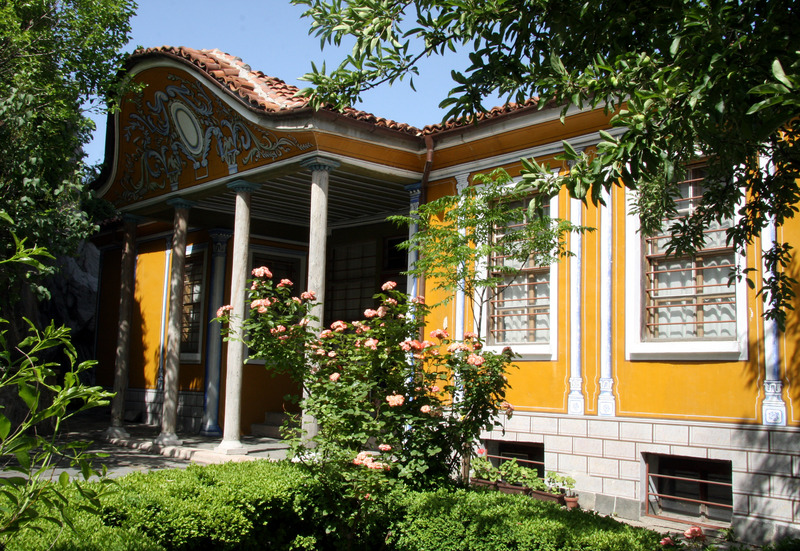 The house is emblematic for Plovdiv`s cultural life. It is a host of many theatrical shows, concerts, exhibitions, literary premieres, and meetings with some of the most expressed Bulgarian writers. Its unique atmosphere is a symbol of love and attentive attitude to the values of art and their creators. This fabulous building was constructed at the beginning of 19th century. It is located on the corner between Chetvarti Yanuari Street, Doktor Stoilov Street and Antranik Street. The big gate on the street side and its opposite door on the yard side lead into an oblong corridor with a high ceiling. Round it there were some farm and household premises. An inner ladder leads to the upper floor, which takes a person away into a large glazed parlour. Its middle part is the most impressive, with a richly decorated wood-carved ceiling. Round the parlour there are four rooms having unique atmosphere. 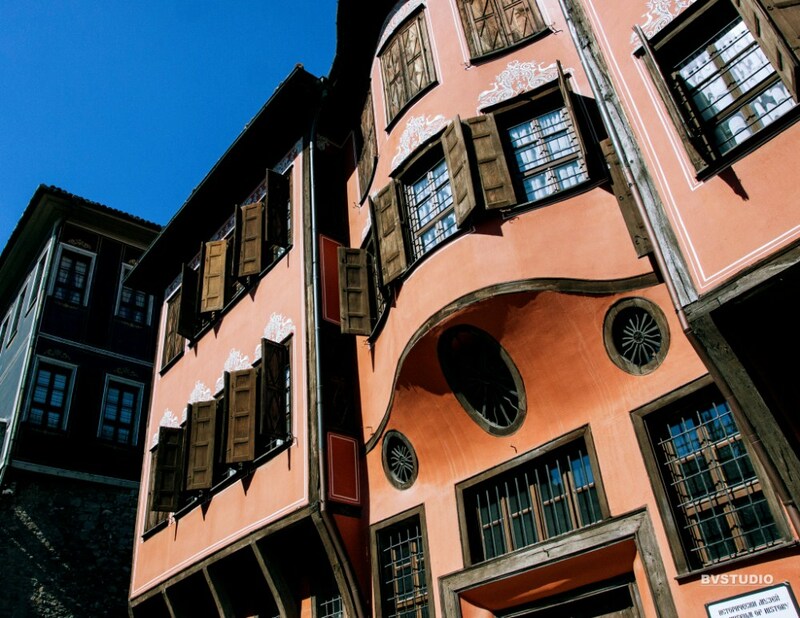 They are upholstered with restored antique furniture, fabrics and other things demonstrating the taste and means of the rich Plovdiv citizens.
. Danov`s House - The house is built on a raising rock and its view on Saborna Street side is splendid. It is located in a beautiful yard which resembles a heavenly terrace. Hristo Gruev Danov, the founder of the organized Bulgarian book-publishing has lived here and the house bears his name. Inside it is richly decorated with murals made of medallions and plant ornaments, along with landscapes and portraits of ancient Greek philosophers. An original brick stove is preserved. 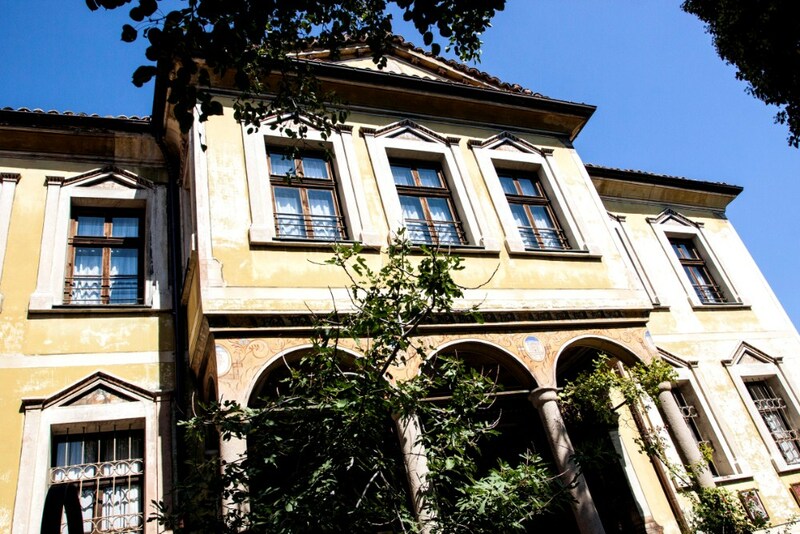 Nowadays the house accommodates the exposition of the Historic Museum Department “The Book-Publishing in Plovdiv City and Plovdiv Region During the Revival". 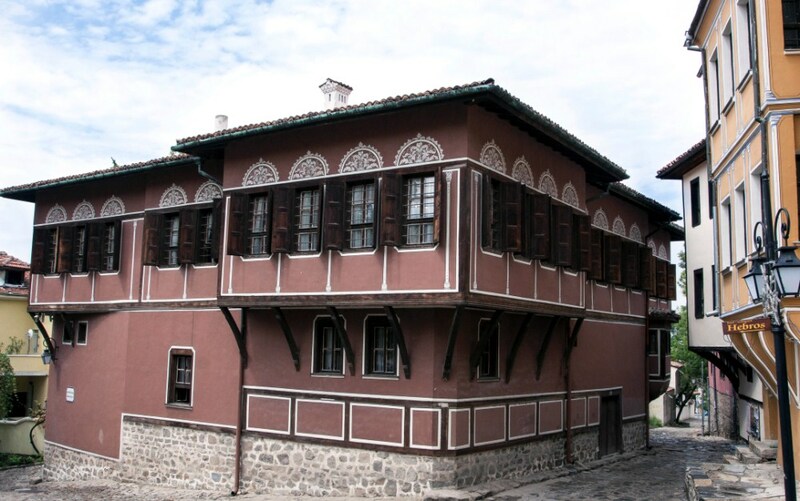 Kuyumdzhioglu`s House ,an Ethnological museum - It is one of the most remarkable Revival houses which is preserved in our lands it is the home of the Plovdiv merchant, Argir Kuyumdzhioglu. It was built in 1847. It reflects the taste of the rich Plovdiver. Thr building`s living area is 570 square meters and it consists of a main housing part and a farm extension on its southern side. There are a marble fountain and a well in the beautifully planted and grassed yard. The entrance is formed with a portico projecting in front, which is caused by the emphasized going out of the second floor parlour in the area. This baroque technique is wonderfully combined with the exquisite curve of the three pediments and the forefront painted with decorations. The first floor hall is of enormous size – 18.5/11 m. The spacious rooms and drawn walls are decorated with wooden ceiling of geometrical shapes, fabulous wood-carved “suns” and elegantly curved “French-fashions”. “The Chamber Music International Festival” is conducted every year in the house`s yard. 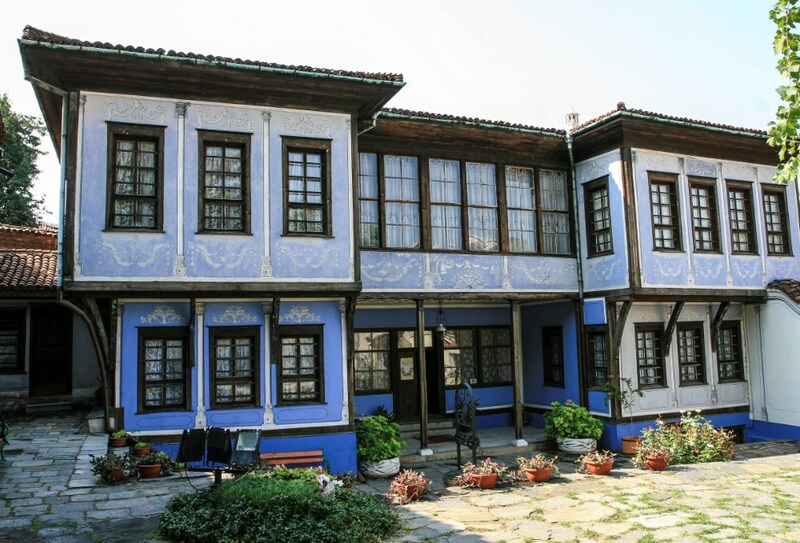 At present, The Ethnographical Museum is located in the Kuyumdzhioglu`s House.The exposition shows the rich material and spiritual culture of the Plovdiv region, which historically covered the territory between Stara Planina (Old Mountain) and the Middle Rhodope and from the upper stream of Maritsa river to the Chirpan uplands. The development of the agriculture, crafts and trade is traced back.The exposition also presents the great variety of the folklore culture – clothes, fabrics, embroideries, music and dances of the main ethnographic groups in the area – Thracians andthe people from Rupite (a small mountainous protected area in the southeastern part of Blagoevgrad Province, Bulgaria). The museum treasures over 40 000 movable monuments of culture.